Site-specific 8 video monitor installation & railway ticket designs, Bilbao, Spain. Commissioned by Carta Blanca for puente...de pasaje, curated by Corinne Diserens. The project @shift used the site of the world's oldest transporter bridge, the Viscaya Bridge in the Basque city of Bilbao, as the focus of the intervention. The Viscaya Bridge designed by Alberto de Palacio y Elissague and built in 1893, both links and separates geographically, historically, economically and politically, the populations of Portugalete and Getxo at the mouth of the Nervion River. On either side of the riverbank, two railway lines link the centre of Bilbao to the mouth of the river in a continuous circuit. Part one of @shift took on the form of 8 video monitors installed in the two ticket offices located on both banks of the Viscaya Bridge. The monitors relayed a continuous 24 hour loop video footage captured through train windows of rail journeys from Bilbao, Spain and Newcastle upon Tyne, UK. The scenery through the Bilbao train window depicted the city’s decaying industrial past lying along the banks of the Nervion River, before undergoing vast regeneration to its current state which now includes the Guggenheim Museum. Through the Newcastle train could be seen glimpses of the Tyne River that once supported the industries upon which 19th century Newcastle built its economy and identity. The two rail journey videos playing in a continuous, deferred a point of arrival. Part two of @shift took on the form of specifically designed railway tickets for the RENFE & Eusko Trenbideak rail companies operating the routes along both sides of the Nervion River in Bilbao. 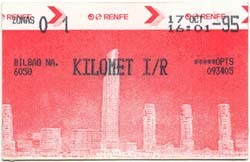 The ticket designs for the two companies (one for RENFE and six for Eusko Trenbideak) featured generic images downloaded from digital cyberspace networks that offered proposals for Bilbao's future that indicated the importance being placed on the future of digital communication links. These dedicated rail tickets were issued to all passengers at rail ticket machines for a period of one month. As they travelled along the route passengers were able to look out of the train windows onto the real physical sites for the future location of the digital generic images featured on their rail tickets. Hans-Peter Kuhn, and Roman Signer.